​Here on the northern plains where I live and write, the temps are hot and roads are clouded with dust. The very thought of ice is nice. Combine that thought with hockey, and it gets even better, especially light of today's news from the National Women's Hockey League. Rather than limiting rosters to seventeen players, teams will be able carry twenty-five women. 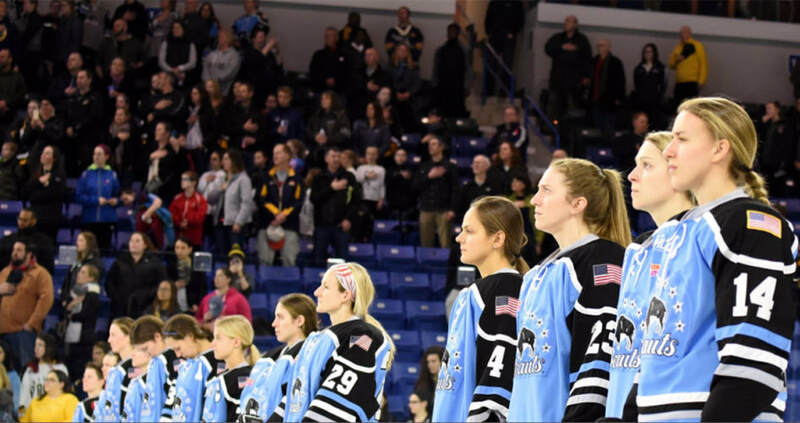 "As we enter our third season, and as the depth of talent in women’s hockey continues to grow, we are excited to provide opportunities to more players,” Deputy Commissioner Hayley Moore said in Tuesday's press release. It's one more step in the right direction for women's sports. As many of you already know, I'm writing about female athletes from all sports as I countdown to the publication of my newest book, Long-armed Ludy and the First Women's Olympics. So far, I've been hanging close to track and field, but today I'll change gears to taekwondo. Today's athlete is Paige "McFierce" McPherson, who last week won the silver medal in the 67-kilo division at the World Taekwondo Championships in Muju, South Korea. Winning the event (6-4) was Turkey's Nur Tatar, bronze medalist from Rio. McPherson (who is from my home state of South Dakota) is a two-time Olympian in the sport, winning the bronze in London in 2012 and competing in Rio in 2016. Last week's World Championships provided a chance for McPherson to regain her world standing. “I listened to my coach and went out there and proved myself, proved my worth and I was able to go all the way to the finals," said McPherson in an article published in the Black Hills Pioneer. And the strong showing, she believes, is a nudge to keep on competing. Anyway, some of the young pups are still in their thirties. Other competitors are over 100 years old. 92-year-old Mary Norckauer is one of the big names. According to the Baton Rouge Advocate, she'll be competing in eleven events: the 100, 200, 400, 800, and 1,500 meters, as well as the discus, javelin, weight throw, shot put, long jump, and triple jump. Her goal is to set records -- world records. Norckhauer said that when she turned 90, she got back into competing seriously. And she did, setting three world records and eight American records. She's no stranger to other sports either. During her earlier years, she was professional figure skate, dance, archer, baseball player, and was on the U.S. pistol team. Though she probably never met Ludy Godbold (although I don't know for sure), they have plenty in common. ​Ludy was a lifelong athlete, teaching women's physical education at Columbia College in Columbia, SC, for 58 years. From what I hear, she was playing tennis (and giving advice) through her seventies. As I mentioned in yesterday's post, I'm going to be featuring a variety of female athletes as part of my countdown to the publication of Long-armed Ludy and the First Women's Olympics (Charlesbridge Publishing, Aug. 2017). So what jumps out at me tonight as I look at my screen? The 3rd annual JavFest -- a three-day festival of javelin competitions for all ages that just finished up in East Stroudsburg, Pennsylvania. Apparently, it's a "stateside version of the great Pihtipudas Javelin Carnival in Finland." Who knew?? Winning the girls high school division was Dana Baker of Olathe, Kansas, with a throw of 169-2. Women's collegiate/open champion was Ariana Ince of Houston, Texas, with a meet record of 201-4. Here's a very cool video from a few months ago that features Dana and her abilities. Apparently, she picked up the sport on a whim to stay in shape for volleyball. So how does this all related to Ludy Godbold? Well, Ludy was a javelin thrower, too. But at the Women's Olympics in Paris in 1922, Ludy threw the javelin with BOTH arms. First, Ludy threw with her RIGHT arm. Then she threw with her LEFT arm. (Yikes, can you imagine throwing a javelin with your non-dominant arm???) Anyway, the two distances were added together. This approach to field events (including the shot put) was discontinued several decades ago. But I'm curious. Any ambidextrous throwers out there?? Hey! It's a hot afternoon in July, and I'm ready to start this blog. As many of you know, my newest book (scheduled for release on August 8, 2017) is Long-armed Ludy and the First Women's Olympics, a nonfiction picture book based on the true story of Lucile (Ludy) Godbold. As a countdown to publication, I'm going to use this blog to feature women's athletes from today and yesteryear (such a fun word!) Anyway, my plans are to cover a wide variety of sports, but don't be surprised if there's a bias towards track and field. So why not start with Ludy? Here are the basics. She was born in Marion County, South Carolina, and attended Winthrop College (a women's college) during the years 1917-1922. There, she excelled in field hockey, basketball, and track and field where she sprinted, hurdled, long-jumped, & even threw the discus. But Ludy didn't make herself known as a shot-putter until her final year at Winthrop. And that's when things started to happen. But here's the cool thing: Ludy's participation in sports was not unusual. Winthrop College (as well as other progressive women's colleges) encouraged and even required young women to take part in physical education. So often people think that girls and women from long ago weren't physically active with sports and competition. Yep, there were plenty of barriers. However, opportunities existed.